I basically want to spare the Lude the winter salts, keep it in a safe driveway. Where I park it down here means I have to rotate the car lest only one side gets a UV battering. Pin dents in our car park are unavoidable, just a question of when. It's essentially done 2k miles a year, a touch over at 29k. Full service history, cam belt change at 24k. No rust issues, Alloys need a proper refurb, and a couple of pin dents. Seats are in excellent condition and the fact that it still has the OEM CD player in-situ suggests a more mature owner? Plans? I've yet to see it in the flesh until I can head back North. In the meantime it'll be underside cleaned and freshly sealed, plus fill the cavities! I seriously have to sort out the audio and the Alloys are rather bubbly. I'll let you know how it drives when I finally get up north. The multi car insurance was a breeze to sort and not too bad. Last edited by norks27 on Thu Feb 07, 2019 8:57 pm, edited 2 times in total. Good to see you at Japfest Silverstone. Managed to get my wheel and tyre fixed in Northampton before heading home. Lucky to find a place open. Very underrated cars these, and very innovative at the time. Keep us posted on your refurb programme! Looks a beauty and a real good find. Happy days ahead I think! Happy to have the CD player if it works etc, updates my Lude from the current cassette player but keeps it Honda! Looks in fantastic condition. Although the brown staining on the drivers seat looks tasty! I like the oem stereo (think I have one of those on the shelf actually) be aware it has a code iirc, so make sure you have that before disconnecting it! PreludePete wrote: Managed to get my wheel and tyre fixed in Northampton before heading home. Lucky to find a place open. 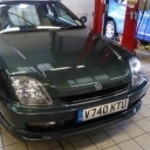 Excellent news, (a Lude with a space saver tyre fitted is never a good thing). I agree with you completely about the potholed roads and keeping the Lude from unnecessary damage. I also like HRVs, but my choice was a good ol' CRV of 2003 vintage. It's spacious, tough and reliable.... plus I like the traditional auto box column shift. Nobody wants to nick it, the odd scrape or ding adds to its character and a set of M&S tyres makes it impervious to potholes. Yes I am an old fart....but we can drive Ludes and workhorses (and old Volvo Amazons and Golf GTis). Like it a lot! Are these the type that used to have "Joy Machine" written on the back when they came out? I think you could also get them in the same sparkly gold that you could get Preludes in. MikeK wrote: I also like HRVs, but my choice was a good ol' CRV of 2003 vintage. It's spacious, tough and reliable.... plus I like the traditional auto box column shift. Nobody wants to nick it, the odd scrape or ding adds to its character and a set of M&S tyres makes it impervious to potholes. Yes I am an old fart....but we can drive Ludes and workhorses (and old Volvo Amazons and Golf GTis). My brother went for a CRV too for all these reasons, plus the compartment in the dash that keeps your sandwich cold and the picnic table in the boot! PreludePete wrote: Good to see you at Japfest Silverstone. Hi Pete, nice to meet you at Silverstone, sorry I couldn't remember your name on the other thread. Glad you got home OK. Thanks for the loan of the chair! eddie_squidd wrote: Like it a lot! Are these the type that used to have "Joy Machine" written on the back when they came out? Sister you used to have one, always liked it, never drove it though. Here she was parked next to the Prelude back in 2000.